Pool and Billiards OPS Get all of your Billiards and Pool news here great information on playing pool, professional news, and the new secret pool cues and equipment in the market today. Always Chalk Your Billiards Pool Cue Stick! 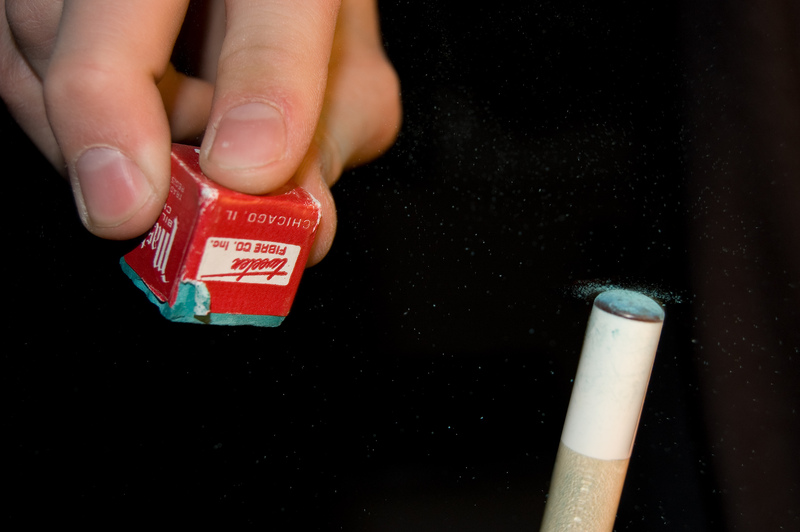 Make it a habit to chalk your pool cue at all times and if you can, do it before every shot. Lots of times some players feel that this is too repetitive and may ruin the next shot by worrying about a chalked pool cue stick but in the long run it will keep your blood pressure low from the absents of mis-cues. There is nothing worse than bending over a table and getting ready for a shot only to have it rub and slip off the cue ball. That horrid sound it makes as the stick goes one way and your cue ball goes a completely different direction will defiantly put a damper in your game. Not to mention if you are on the last 8-ball or 9-ball shot for the game winning stroke. Also it is very important to select the best chalk for you cue stick, if you own your own pool cue stick do not use chalk from a bar or pool establishment. There are 2 things already that is going to go wrong, the first is that most pool halls purchase the cheapest chalk possible. And the second is that most people are not sanitary with the chalk, already in the chalk hole there could be anything from dirt to grease in the cavity, which again will go back to many mis-cue shots or even ruin your pool cue tip. It is very important to keep you own chalk for your own pool cue. Depending on your pool cue tip you may want to find a hard or soft chalk if you do not know which you need it would be better to find a pool cue specialist that will educate you on which is which. If you must use the community pool cue chalk you may want to run a piece of paper towel in it to get any dirt or grime that may damage your pool cue tip. You should never go cheap on chalk if you own cue stick. For example you don’t pour used oil into your car for an oil change, so why would you select used chalk for your new Cue tip. You can get all the pool chalk and billiards chalk you need at Official PRO Sports the leader in Sports merchandise. I am using blue diamond chalk right now. Is that the best chalk all around to use? I don’t want to use masters since that’s all I see in any public establishment that has a pool table. Blue Diamond chalk is really good and developed to be more of a creamy chalk than a powder chalk so it will stay on your tip longer and seep into the tip pores for great tip to hit action. If you are worried about loosing your chalk to the local public establishment invest in a pool chalk holder, there are even some that comes as a belt clip and you pull the chalk off from the belt. Sweet and I’m happy I made the right choice. This is why I only buy products that have a rating. And a good one for sure. I am trying to find a way to request permission to copy the image accompanying this article the cue tip and chalk-in-hand. Copyright Pool and Billiards OPS 2007-2011. All Rights Reserved.